Search Results for "moon cake"
Green moon cake dessert on a plate. The Mid Autumn festival marks the end of the harvest season. An important Chinese holiday celebration often referred to as the Mooncake or Lantern Festival. Chinese mid autumn festival foods. Traditional mooncakes on table setting. 4k footage video. Panettone Pandoro Rotate Moon Sun. A Panettone rotating around a Pandoro (traditional Italian type of sweet bread loafs, most popular at Christmas), like Moon, Earth or Sun. 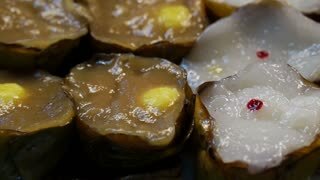 Chinese Pastry, sweet and tasty salty snack. Hand keep traditional Chinese cake.Time lapse 4k. Culture of China. An intricately designed green mooncake on a white plate. Traditional food to celebrate the Chinese mid-autumn festival, or the Mooncake or Lantern Festival. ZOOM IN camera rotating. Traditional pastry mooncakes is offered to friends or family during Mid-Autumn Festival. Chef making traditional Chinese cake.